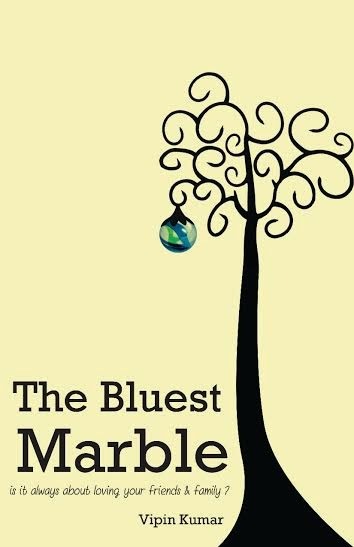 The Bluest Marble by Vipin Kumar is an inspiring novel. It is the story of an ordinary young man who has simple goals in life, but life has other plans for him. As the story unravels the readers get to know about the various facets of his life and personality. The protagonist of the story is Aditya. He has a good job, good friends, a great bike (he is passionate about it), loving and caring parents. But, as destiny would have slowly things slips away from him – he is fired from his job, his friends desert him and his parents begin to see him as a loser. Aditya doesn't feel there is anything in his life worth living for, so he decides to end his life. And thus begins a new chapter in his life. Aditya lands up in a mental asylum where he is named as Ram Kumar 125 – a name given to patients suffering from amnesia. Well, Aditya is not amnesiac, but he pretends to be so that he doesn't have to go back to his old life. He makes friends with Rajesh – a software engineer and Jacky who is a Doctor in theoretical physics. Amidst the new surroundings, new home and new friends, Aditya experiences life like never before. He discovers himself, his inner self and his key to happiness. What happens to him in the mental asylum? How he survives there? How he finds the secret to happiness – the bluest marble? You have to read the book to know about the same. The book is narrated in flashback; the protagonist is telling the story of his life to his girlfriend and would-be wife Jenny. The first part of the novel dwells on the kind of life urban bachelors working away from home in big cities live. There are various incidents and situations to which readers can relate. The writing style is simple and clear. However, at some point I did feel the narration wavering. I didn't quite relate to the conversations he has with his bike and often found them somewhat creepy. The experiences of the protagonist when he landed up in the mental asylum were the most interesting and intriguing part of the novel. I loved the way he gradually fought with his fears and insecurities and took to life head on. Overall, it was a great read and inspiring in many ways. One of the things that I would have wanted to read about more is about his friends – Rajesh and Jacky in the mental asylum. If the author ever thinks of writing a sequel to this book – I would love to read how his friends did in life and how Aditya’s life took shape.